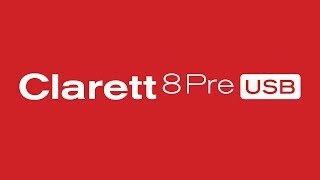 Clarett 8Pre USB | Focusrite Audio Engineering Ltd.
Ultra-low noise mic preamps, ultra-low distortion and 118dB dynamic range 18-in, 20-out USB audio interface. Solid beast of a machine - fast, crisp and cristal clear, any sound that goes in will be translated musical, professional and just perfect. 8preamps with such perfection is well worth the money, actually the Clarett series competes a different league. The Clarett works like a dream and can link via optical to older devices, which indicates a company who aren’t out to dwindle their clients. Focusrite also have the best technical support I’ve ever experienced. Great and reliable gear highly recommended for any studio . For the price this thing is at. It packs a whole lot of punch and sounds great! Love it! Clarett USB lays down the challenge to interfaces twice the price. The Clarett USB range features specially designed high performance, low-noise (-128dB EIN) mic pres with a low distortion, ultra-linear design that guarantees a clean, open and transparent sound, giving accurate representation of the original performance. Boasting 118dB dynamic range, Clarett can now be experienced with any Mac® or PC supporting USB 2.0 and above. Decades of analogue circuit design experience, applied around 24-bit/192kHz A-D and D-A conversion, delivers a superior signal path – beating interfaces costing hundreds more. Clarett 8Pre USB is an 18-in, 20-out audio interface. Six-segment LED metering easily shows the signal level of the eight mic/line inputs, two of which are also high-impedance instrument inputs that can record super-hot pickups with no unwanted distortion. MIDI I/O and S/PDIF I/O are also included. ADAT I/O allows you to expand your setup with up to eight extra inputs and outputs when combined with multi-channel mic preamps like Clarett OctoPre. Analogue outs include two monitor outputs with anti-thump technology, eight line outputs, two headphone outputs with volume controls, and a word clock output for sending clock signal to external devices. The eight Air-enabled mic preamps can reproduce the input impedance, clarity and frequency response curve of Focusrite's original ISA mic preamp. Clarett 8Pre USB connects to Mac® or PC using the included standard USB and USB Type-C™ cables. Record with super-low latency through amp simulators and effects plug-ins.